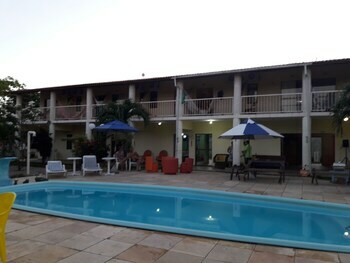 With a stay at Pousada Chiveve Lagoa da Banana in Caucaia (Lagoa do Banana), you'll be a 2-minute drive from Banana Lagoon and 5 minutes from Cumbuco Beach. Featured amenities include dry cleaning/laundry services, luggage storage, and coffee/tea in a common area. Free self parking is available onsite. With a stay at Ilive 020 - 2 Bedroom Ipanema in Alto da Boa Vista (Ipanema), you'll be within a 15-minute drive of Parque Henrique Lage and Ipanema Beach. With a stay at Shangrilá - Rede Soberano, you'll be centrally located in Porto Seguro, just a 3-minute walk from Porto Seguro Municipal Stadium and 6 minutes by foot from Avenida Shopping Center.